Seattle is more affordable than Detroit? How's that even possible? The median monthly rent for a one-bedroom apartment in Seattle is nearly $2,000, while the median rent for the same apartment type in Detroit is $780. So, Detroit is clearly the more affordable market, right? A new study by Rent.com released Friday reveals that determining rent affordability is far more complicated than simply examining rental rates. The median annual income plays a large part in affordability, thus why Seattle, with it’s $2,000 per month median rent, is more affordable than the Motor City. In Detroit, the average worker earns about $22,000 post-tax, which means that housing costs account for a whopping 42 percent of their monthly expenses — 12 percent more than the affordability threshold of 30 percent. Meanwhile, in Seattle, the average worker has a net income of $63,600, which means housing costs account for 38 percent of monthly expenses. That’s still above the affordability threshold, but 4 percent more affordable than Detroit. New York City clocked in as the least affordable city, with rent accounting for an ungodly 121 percent of a city dweller’s paycheck and the median-priced one-bedroom apartment hovering around $4,365, according to the report. Boston, Los Angeles, San Francisco and Philadelphia rounded out the top five least affordable metropolitan areas while the Texas cities of El Paso, Fort Worth and Austin were named the most affordable rental markets overall. 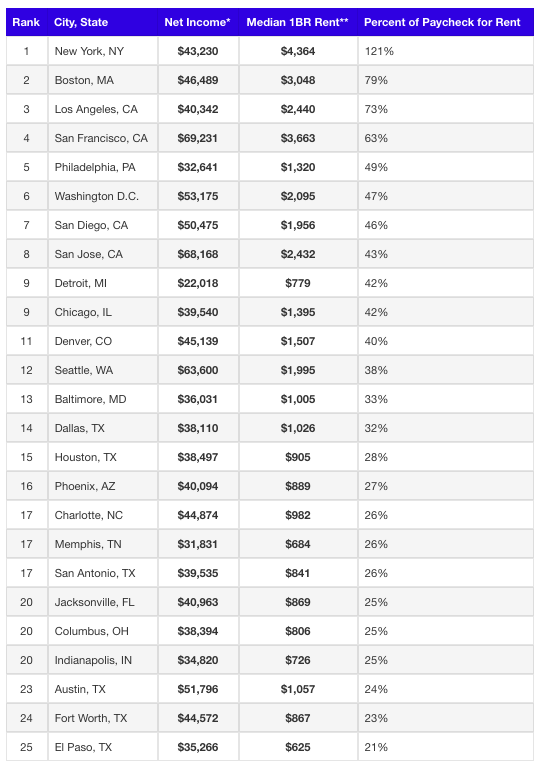 The affordability ranking for the 25 largest metros in the U.S. Renters in Los Angeles, San Francisco, Washington D.C. and Philadelphia are in a similar situation, according to the report. While none of these markets are cheap, San Francisco and Washington D.C. are more affordable than their neighbors, Los Angeles and Philadelphia. In San Francisco, the median rent for a one-bedroom apartment is $3,663, $1,223 more than the median rent in Los Angeles ($2,440). But with a median net income of $40,342, renters in Los Angeles will spend 73 percent of their budget on housing costs. On the other hand, San Franciscans who have a median net income of $69,231 will spend 63 percent of their budget on housing costs. The trend continues in a comparison between Washington D.C. and Philadelphia. The median rent in Philadelphia is cheaper ($1,320) than Washington D.C. ($2,095), but workers in the City of Brotherly Love have a median net income of $32,641 — $20,534 less than what Washingtonians make ($53,175). That difference in income means Philadelphians spend 49 percent of their income on housing costs, while workers in Washington D.C. spent 47 percent. On the extremes are New York City and El Paso, Texas. New York City is the most expensive market for renters, with a median net income of $43,230 and 121 percent of that income going to a median-priced one-bedroom apartment ($4,364). El Paso, however, is the most affordable market for renters. A worker making a median net income of $35,266 will only spend 21 percent of their income on a median-priced apartment ($625) in the area. Rent.com took the median household income from the U.S. Census Bureau for the 25 most populated cities in the country and used an ADP salary paycheck calculator to determine the median net income with standard withholdings and no deductions. They then compared this figure to RentPath data of median rental rates for a one-bedroom property in each specific city to determine the percentage of your median monthly pay that will go towards the minimum median rent.